As a high school and early college student, I went through a completely cliché phase in which I (church youth group member, honor student, giant nerd) wanted to date guys who were “rebels.” But I didn’t know any meaningful rebels, so I mostly settled for guys who had bad tattoos, no ambition, and smoked a lot of weed. This meant we went to Taco Bell often. Friends and I would joke about Taco Bell as our sort of restaurant of last resort; the only place we could go reeking of pot and stale car smell and not feel embarrassed. Hey, everyone in this line looks as grungy as we do! We’d stumble through orders for our Crunchwrap Supremes and Baja Blasts and devour them in parked Toyota Camrys while listening to Saves The Day. (Glory days, I tell you.) Taco Bell was the place we frequented out of habit, but never something we’d brag about. The “cool” kids went to more polished restaurants like Qdoba or Cosi or Johnny Rockets, with its tabletop jukeboxes and shiny white tile. Taco Bell was definitely a lesser-tier destination. Golfer Wesley Bryan sports a Taco Bell belt during the first round of the 2018 RBC Heritage at Harbour Town Golf Links in April in Hilton Head Island, South Carolina. But in the years between my suburban New Jersey ennui and present day, Taco Bell has undergone a huge image makeover. People aren’t ashamed to like it anymore; on the contrary, kids are taking prom photos there and bragging about how much they love Nacho Fries. We at The Takeout take a firm “no food shaming” stance, believing that any food that makes you happy is worthy of celebration. But it’s hard to deny the change that the ol’ Bell has undergone. 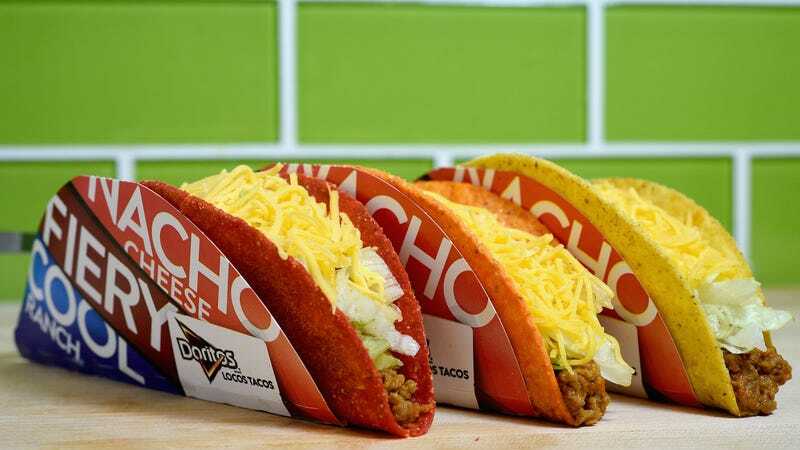 Exhibit A: In a new Equitrend Harris Poll, Taco Bell was named America’s favorite chain Mexican restaurant for the first time in the Equitrend survey’s 30-year history. It beat out beleaguered Chipotle and past winner Moe’s Southwest Grill to take first place this year, confirming that it’s officially gone mainstream in terms of its popularity. How exactly Taco Bell upgraded its image is probably best left to analysts with MBAs, but I’ll go ahead and say that Nacho Fries and the Naked Chicken Chalupa can’t hurt. The Harris Poll hypothesizes that Taco Bell’s “innovation” combined with its slick marketing and breakfast menu combined to help it reach Mexican fast-food dominance. I guess this mainstream popularity allows me to say that I liked Taco Bell before it was cool... like, way before it was cool. Come on sheeple, why don&apos;t we eat more fast-food lamb?